"The love of liberty brought us here"
'S e dùthaich ann an Afraga a tha ann an Libèiria no Libiria, ainm oifigeil: Poblachd Libèiria. Tha crìochan aice san ear-thuath le Gini, san iar-thuath le Siarra Leòmhann agus san iar le Costa Ìbhri. Tha Libèiria suidhichte aig a’ Chuan Siar. 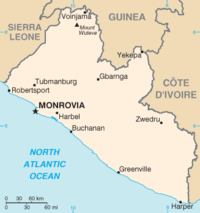 'S e Monrovia am prìomh-bhaile aice. Tha eaconomaidh na dùthcha anns an droch staing, o chionn 's gun robh dà cogadh chatharra ann, ris an canar First Liberian Civil War (1989–1996) agus Second Liberian Civil War (1999–2003). Air a tharraing à "https://gd.wikipedia.org/w/index.php?title=Libèiria&oldid=540440"
Chaidh an duilleag seo a dheasachadh 20 dhen Dùbhlachd 2017 aig 13:19 turas mu dheireadh.